Moazzam Begg : The Two-Way Moazzam Begg was held by the U.S. for three years before being released from Guantanamo in 2005. He was never charged with anything. Now, British authorities are questioning him about trips to Syria. 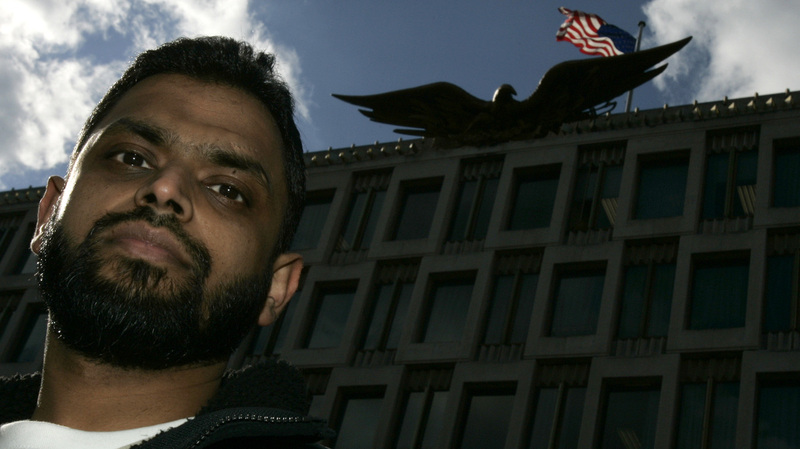 Moazzam Begg in front of the U.S. Embassy in London in 2006. Nine years after his release from the U.S. detention center at Guantanamo Bay, Cuba, a British-born man named Moazzam Begg is once again in custody and being questioned about alleged ties to terrorists. Begg was one of four people arrested Tuesday in Birmingham, England, British authorities tell Reuters and other news outlets. "West Midlands police said those arrested were connected to alleged Syria-related terrorism offenses. Begg, 45, was arrested in Hall Green, Birmingham, and is suspected of attending a terrorist training camp and facilitating terrorism overseas." "Begg, a British citizen originally from Birmingham, moved to Afghanistan with his family in 2001 before moving to Pakistan in 2002 when the war started. He was arrested in Islamabad in January 2002 and taken to Bagram internment center in Afghanistan for about a year before being transferred to the Guantanamo Bay U.S. detention camp in Cuba. He was released in January 2005 with three other British citizens and returned to the U.K."
While in U.S. custody, Begg was never charged with a crime or with being an enemy fighter, even though, as The Atlantic writes, American officials claimed Begg had trained with al-Qaida and "was preparing for attacks on Americans." "He was ordered released by President Bush in 2005, as a concession to Britain, where America's detainee policy was under severe criticism across the political spectrum," The Atlantic adds. "The CIA, Pentagon, and FBI objected to Begg's release, saying that he was a dangerous terrorist." Begg has denied training at an al-Qaida camp in Afghanistan and has said that another training camp he visited there in the 1990s was run by Iraqi Kurds who were learning how to fight against Saddam Hussein. After being released from Guantanamo, Begg wrote a book — Enemy Combatment: My Imprisonment At Guantanamo, Bagram and Kandahar — in which he made the case that he had been detained illegally and had been tortured while being held at the Bagram air base north of Kabul. He also went to work for CAGE, a U.K.-based organization that says its mission is to document "the abuse of due process and the erosion of the rule of law in the context of the war on terror." Begg spoke to NPR in September 2006, telling Morning Edition host Steve Inskeep that he had been detained by U.S. authorities not only because he had been on the ground in Afghanistan and Pakistan, but because he had visited a training camp in Kashmir in 1993 and had gone to Bosnia in the mid-1990s to aid Muslims during the wars there. In those cases, Begg said, he was not working with al-Qaida or Taliban fighters.